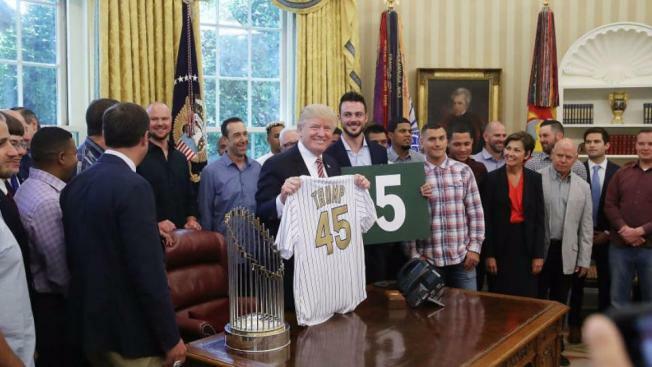 President Donald Trump has welcomed the manager and several players from the World Series champion Chicago Cubs to the White House. Trump met with manager Joe Maddon and some Cubs' players on Wednesday, and called the Cubs a "great team." They gave him a team jersey printed with "45" in recognition of his status as the 45th U.S. president. Maddon had said the visit was voluntary for players and not an official trip. Maddon said he was going to the White House out of respect for the Ricketts family, which owns the Cubs and donated to Trump's campaign. The Cubs are in Washington to play the Nationals. In January, the Cubs visited President Barack Obama at the White House after winning the World Series and shortly before his term ended.